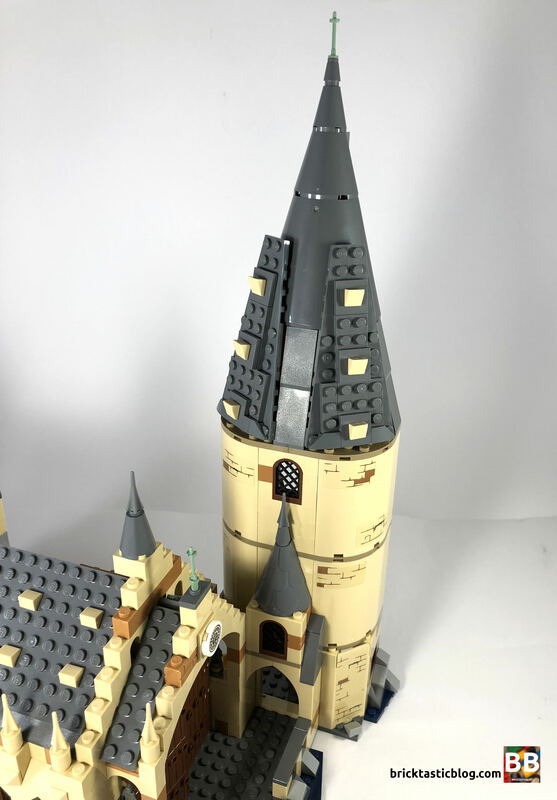 Over the last month or so I’ve been reviewing the Wizarding World sets based on the original Harry Potter franchise, and the last one on the list is 75954 Hogwarts Great Hall. It’s the biggest of the theme and showcases a lot of attention to detail. 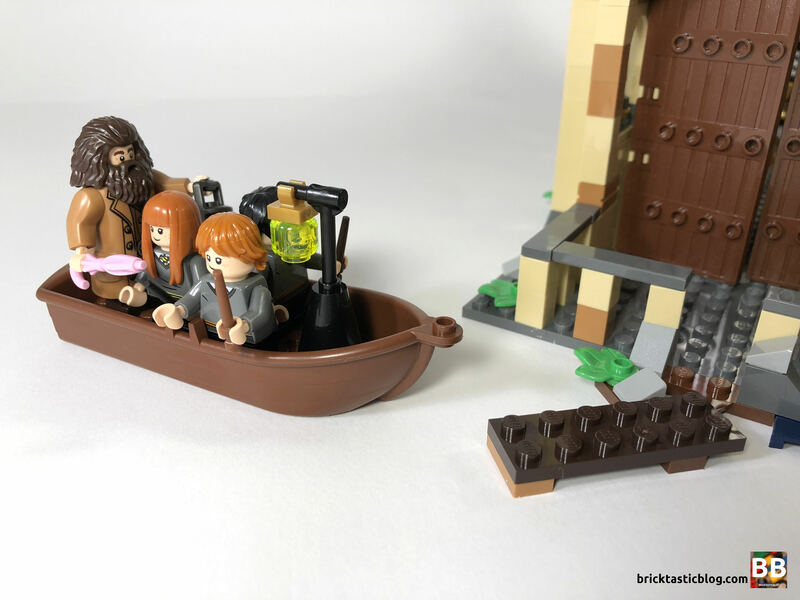 There’s 10 minifigures, some animals, a boat, and a brick built Basilisk, as well as lots of things to look at both inside and out. The box contains six numbered bags, a rather thick instruction book, one 8×16 and two 16×16 dark stone grey plates, and two sticker sheets with 20 stickers all up. There is a lot of minifigures included in this set – 10 of them. 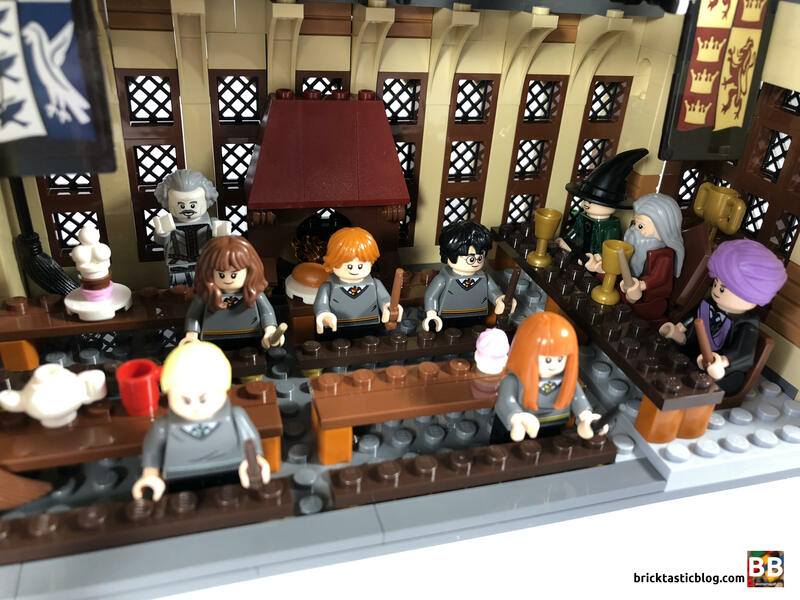 There’s five students – Harry, Ron, Hermione, Draco Malfoy, and Susan Bones, and five adults – Dumbledore, Professor McGonagall, Hagrid, Professor Quirrell, and a ghost – Nearly Headless Nick! It’s an impressive assortment. The students all have very similar clothing – shirts, ties and sweaters on the top, and short black legs. Each is carrying a wand. The differences lie in the house colours. Our favourite three with Gryffindor, Susan in Hufflepuff (my chosen house according to Pottermore), and Draco with Slytherin. 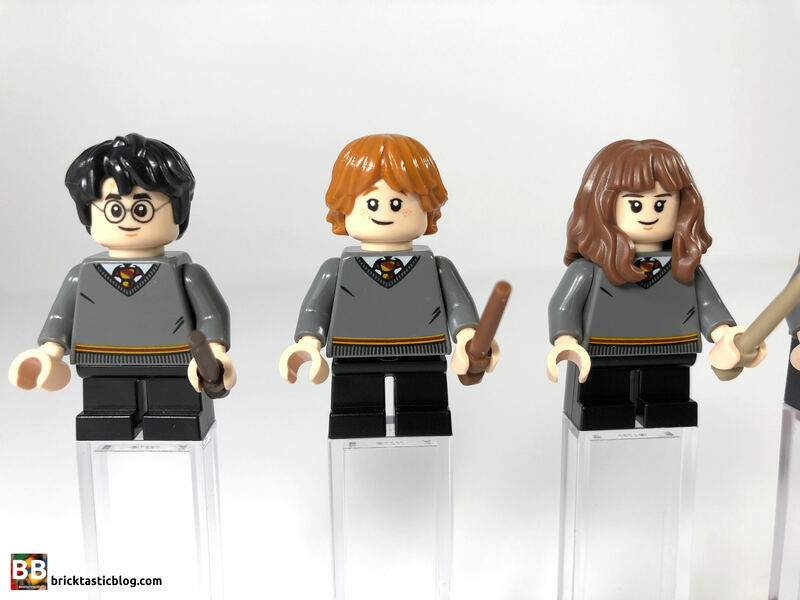 It’s excellent to have a Hufflepuff representative in LEGO! The facial features are all excellent quality. 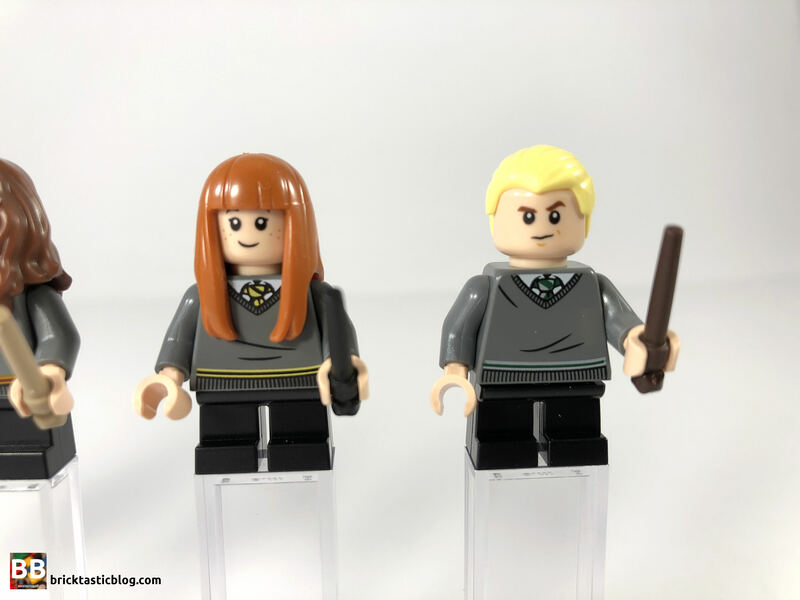 Harry, Ron, Hermione and Susan all have happy faces, with the first three scared, and Susan just sad on the opposite side of the head element. In addition to their wands, Harry and Ron have their pets, Hedwig and Scabbers. We’ve seen these elements before, but they’re still a welcome addition. Draco, of course, is sneering and angry. The head and hair pieces for all students are excellent, and interestingly, Susan’s is the only one made of soft rubber. 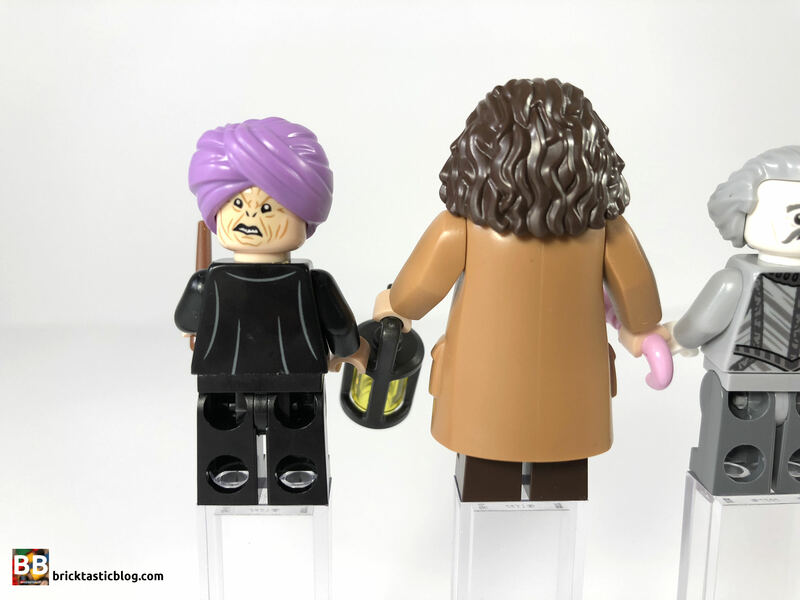 The adult minifigures are of exceptional quality, and all are unique to the set. Professor Dumbledore is a nod to the first Dumbledore of the film series – Richard Harris. The printing on the torso and legs is stunning, and incredibly detailed, with red and gold patterns. The hair piece is also new, and the face portrays a kindly figure with glasses, and a slightly more serious, no-glasses face on the other side. Dumbledore carries a wand. Professor McGonagall is just as detailed on her torso and legs, this time in dark green. She’s happy and angry, and has a black witch’s hat on her head, and has a wand. 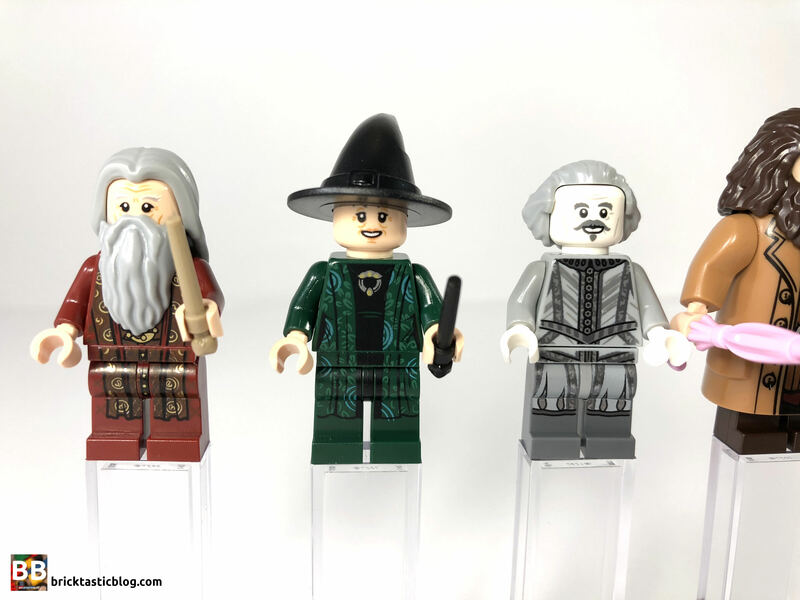 Nearly Headless Nick is a superb addition to the set, and as the ghost of the Gryffindor Tower, and the most famous of the ghosts, he’s a brilliant choice. Once again there is some amazing detail on the torso and legs, with some silver highlights, and his hair is excellent in a new colour – light grey. 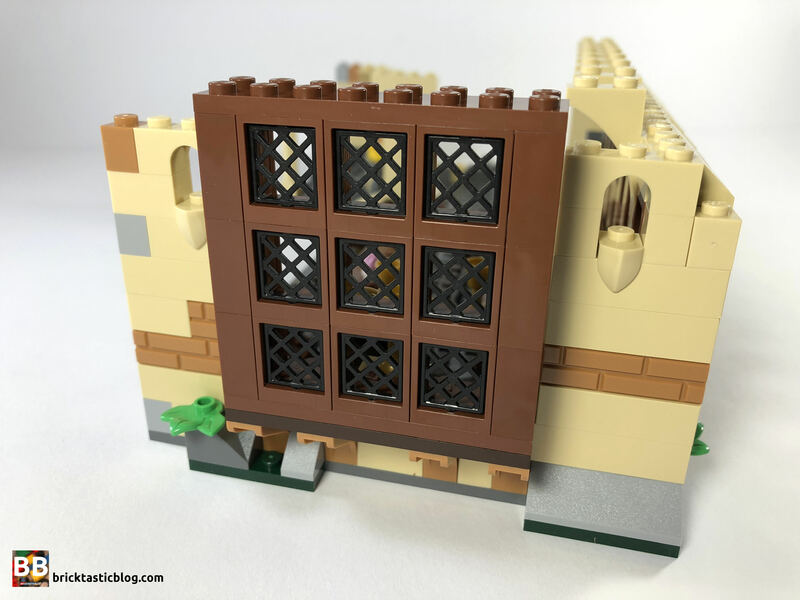 This hair piece has been seen before in Spring Yellowish Green in The LEGO Dimensions’ Beetlejuice, and in Dark Orange in the massive microscale 71043 Hogwarts Castle. 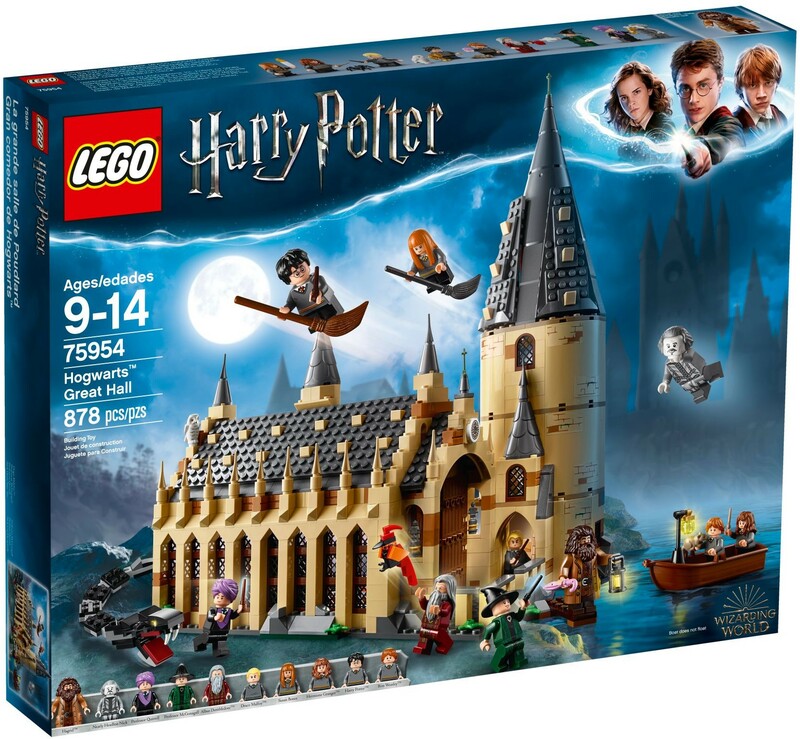 Incidentally, the new light grey colour is also available in the recent gift-with-purchase set – 40289 Diagon Alley. He’s happy and slightly worried, and makes me very happy! Hagrid is a brand new torso mould, and is a big improvement over previous versions, where he looked like he was continuously shrugging! His hair is also redone, and together, looks spot on. His arms are connected with Technic pins built into the arms, but his legs are the smaller fixed legs, so don’t move. He has his magic pink umbrella which looks spot on (and new in pink), and a lantern. Finally, there’s Professor Quirrell. He has only appeared once before, and this version is poles apart from the predecessor. With some lovely printing on his torso, and a new coloured medium lavender turban, he looks great, but what’s absolutely magnificent about him is on the other side of his head. As he is sharing his body with Voldemort, the nasty visage of He Who Shall Not Be Named is on the back of his head, and it’s perfectly terrifying! In a different colour, crooked and seriously not happy, it’s one amazing inclusion. There’s a lot of other excellent parts inclusions, but the big highlights for me must include the Sorting Hat. We’ve finally got a perfectly moulded hat, true to the movie representations. It’s perfection, and a huge improvement on the printed version from 2010. 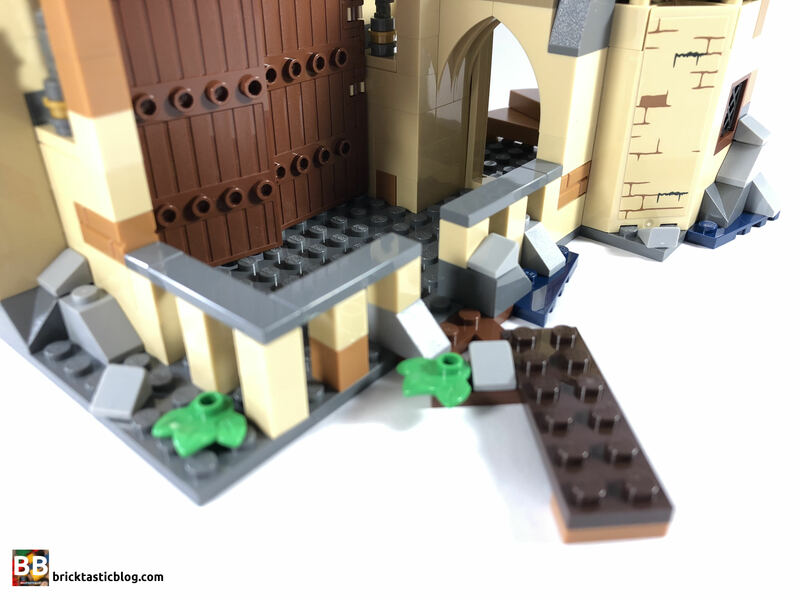 There’s also those moulded conical roofs, the 1×1 double sloped roof tile, the spiral stairs, minifigure trophies, dark red 2x2x3 corner roof elements, more candles and flames, right and left cut 1×2 sloped tiles, two varieties of 1x1x2 design cut bricks, large doors, 40 of the new small window lattice, and a Fabuland pot, just to name a few! 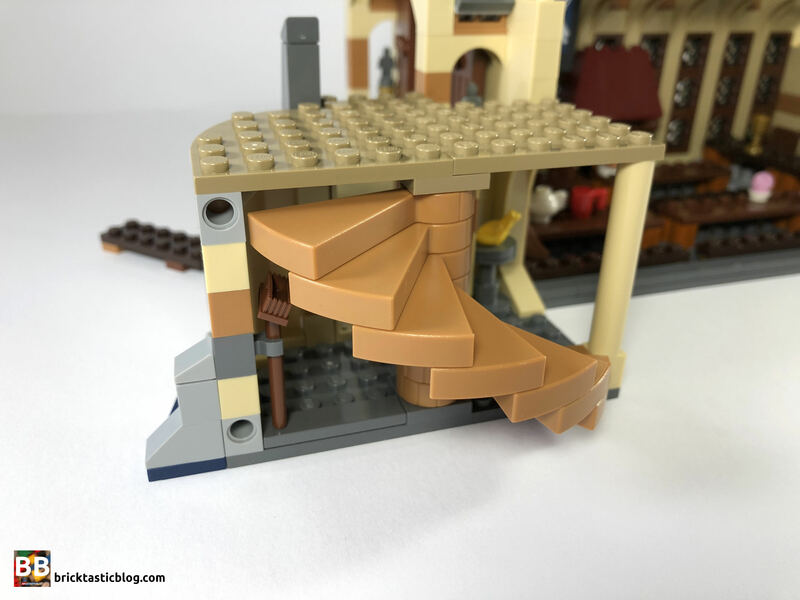 There’s a lot of play options with 75954 Hogwarts Great Hall and it’s not just from the Hall itself! 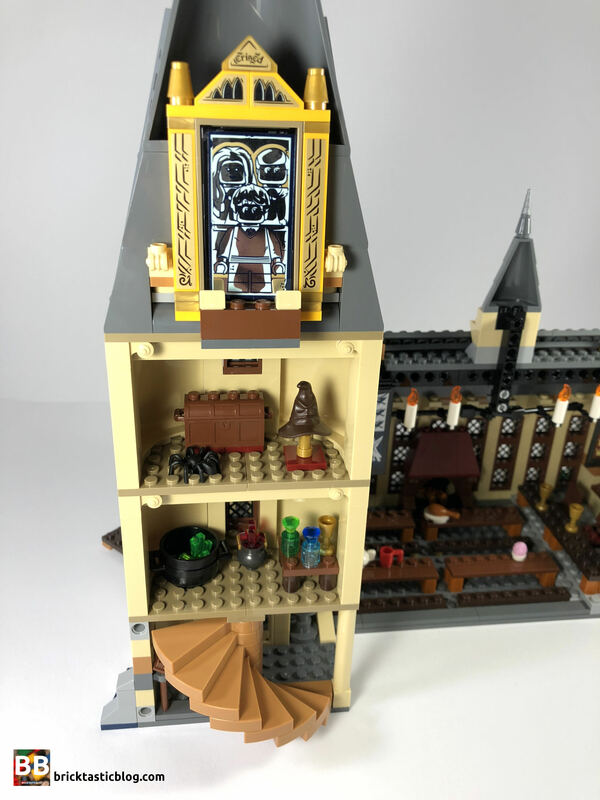 With a boat and landing dock, those grand doors, a spiral staircase, the Sorting Hat, the Mirror of Erised (with four stickered mirror images), Nagini and more, you’ll have a lot of fun with this one. The house banners hanging from the ceiling are also able to be rotated, depending on your preference. 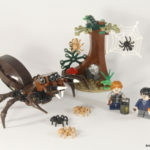 You can also connect it to Whomping Willow for more set interaction, and a very impressive display. There’s also plenty of space to pose the students and teachers inside the hall. It’s a lot of fun. The build begins with the simplest of builds – the lantern on the boat. It would have been better had this been a yellow transparent head, rather than a neon one, but that’s easy to change later. The Mirror of Erised is also built. 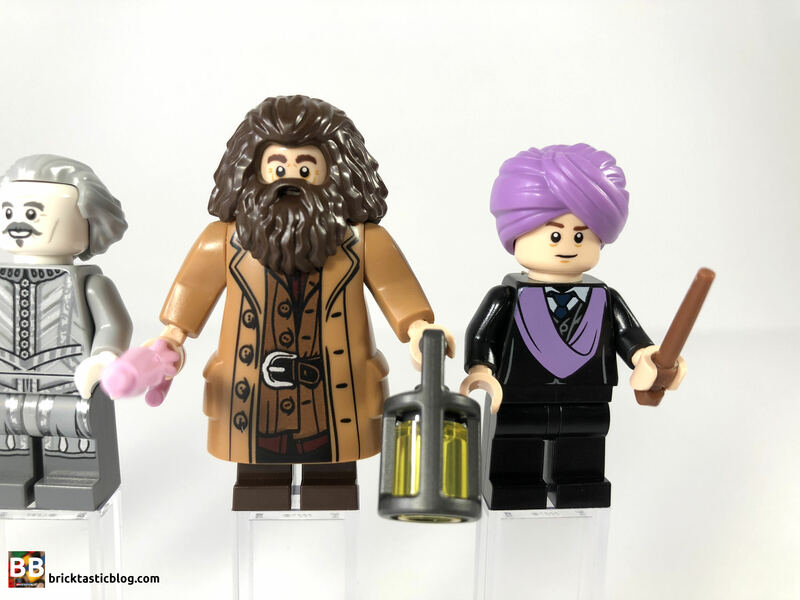 There’s four surfaces – Harry with his parents; Dumbledore with a pair of thick woollen socks (what he tells Harry he sees in The Philosopher’s Stone) Ron as Head Boy, Quidditch Captain for Gryffindor, and holding the House Cup; and Professor Quirrell with the Philosopher’s Stone. It’s a wonderful nod to the original story. 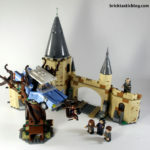 The other smaller builds are Fawkes, Dumbledore’s phoenix, and the Basilisk. These are simple builds, but good additions. I particularly like Fawkes. 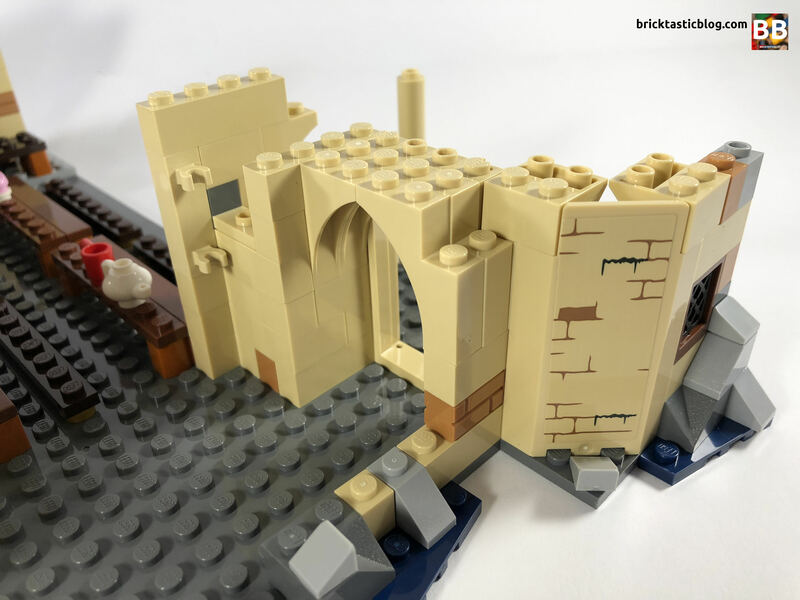 Once the smaller builds are done, it’s time to start on the main piece – the Great Hall. The foundation is laid, in addition to the footing of the walls, the teacher’s stage, fireplace, and tables and chairs. At this point it is all very basic building, but there is a little highlight already. 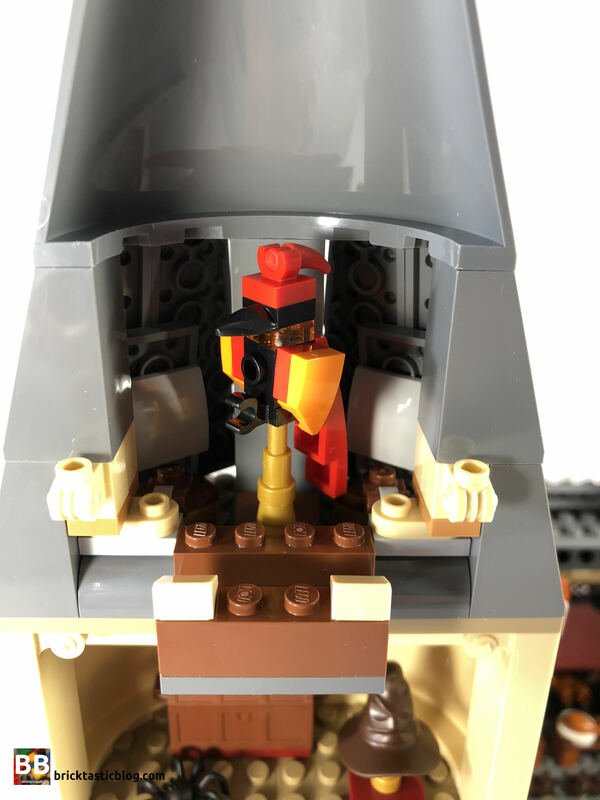 Dumbledore’s chair is simple, but looks marvellous, using a Nexo Knights shield element in reddish brown. Next is the main wall and the bay window. These two sections are highly repetitive, with 40 of the latticed windows to be set up. It’s a bit of a slog, but it’s worth it. The entrance to the main tower is started, followed by the entrance to the hall, with those massive doors! A bit more repetitive detail is added to the wall and entrance, followed by the roof section, and the “hovering” candles – the final detail in the main hall. On to the tower. The stairs are added first. I’ve never had the opportunity to use these before, so I was surprised about the lack of grip they had. After seeing the parts, though, it makes sense, and is good to be able to swing them to one side for play access. 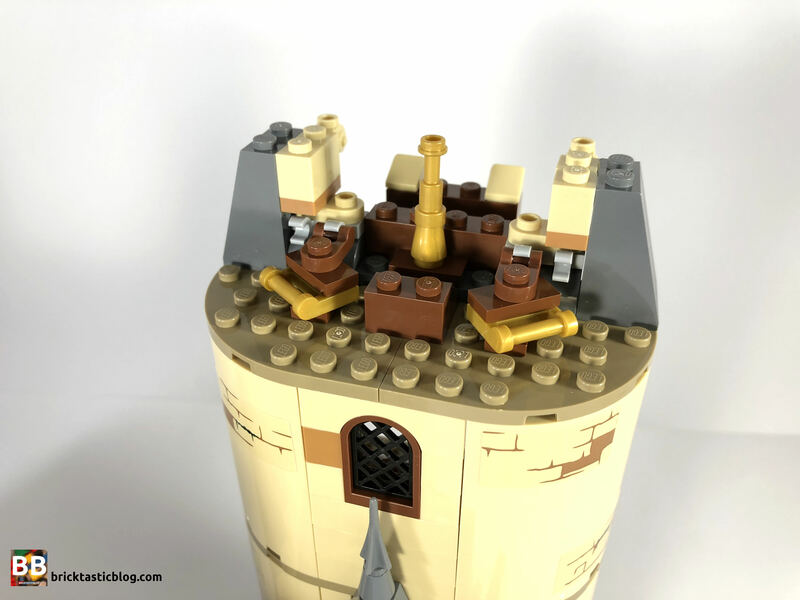 The tower slowly rises off the table, with some simple internal details, and includes some LEGO geometry trickery, similar to that used in the Saturn V build. It’s all used later to clip the angled panels on the massive tower of the roof. 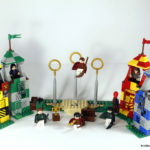 The final details include adding the Sorting Hat and Fawkes to their stands, and slotting the Mirror of Erised in to cover Fawkes. Hogwarts Great Hall is a lot bigger than I originally expected. It looks phenomenal, with some serious attention to detail. This attention to detail is seen in the Mirror of Erised. While it looks good (especially the mirror surface stickers), it’s a shame the gold stickers are stuck on yellow parts. It clashes slightly, but not too much, as the focus is on the mirror surface. One of my favourite details is also the most understated – the bay window. There’s honestly nothing to it, but it looks great. There’s also the floating candles, using some basic Technic parts, and the flippable banners – these in particular look brilliant. The printing is stunning, and matching the black against the black roof parts just add to the effect. The hall is quite paired back, but still appears detailed. I love the little plates of food on the tables. The only thing I’d love to see is a bigger hall, with more floating candles. It would look amazing! I think the 1×1 double sloped parts are meant to represent dormer windows, and they look great. The roof of the main tower looks a little odd to me. 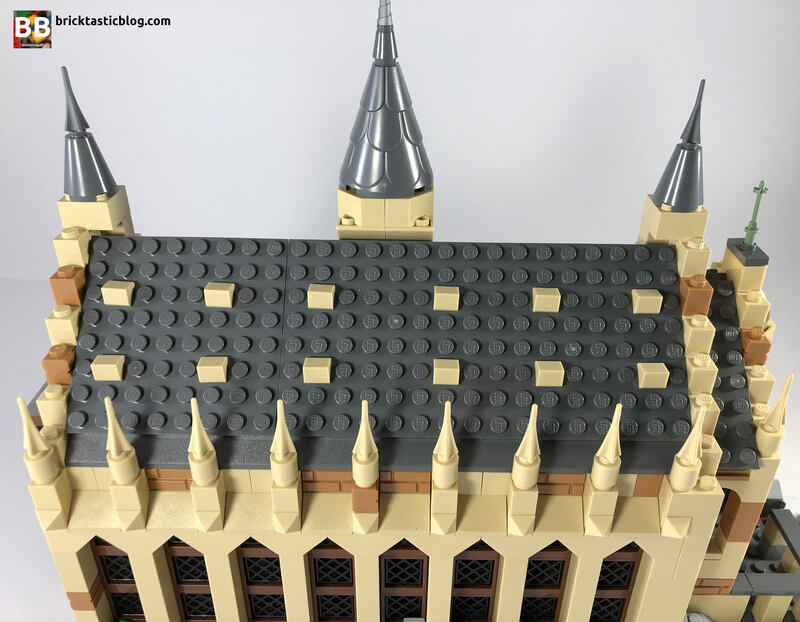 The combination of the angled plates and tower roof elements, with the sloped bricks looks alright from a distance, but up close it’s slightly jarring. It works better at a lower level, but closer to the peak it becomes more obvious. I’m not sure what else could have been done, save from creating a whole new element, but it’s a fair solution. The 2×6 plate that serves as a jetty is a nice inclusion, but I feel there could have been a little more effort here – it feels like a bit of an afterthought. The dark blue 2×4 wedge plates also seem a little strange. I understand they’re to create the illusion of water, but there’s not enough of them to pull it off. 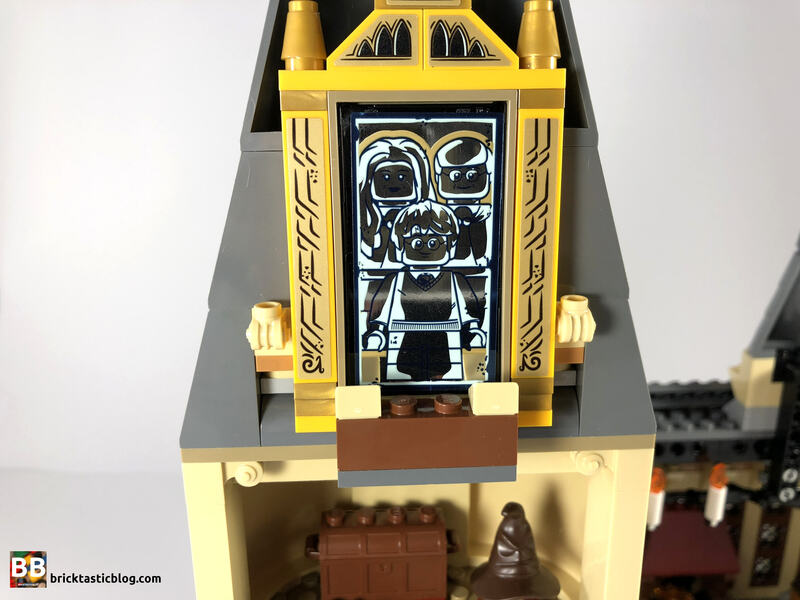 The huge doors are stunning, and haven’t been seen since 2016’s 71040 Disney Castle. There’s a number of other sets, but only nine others, so it’s great to have a couple of them. This set is beautiful. It’s big, bold and has a lot going for it. At face value, this set isn’t cheap. 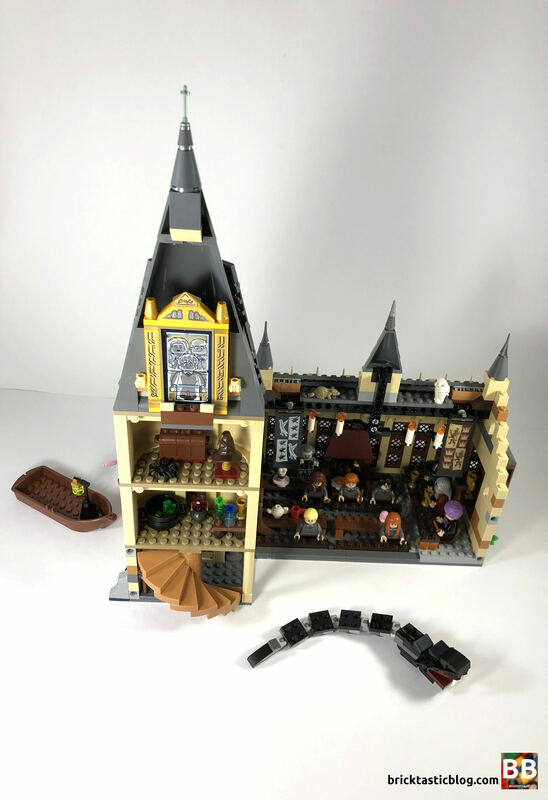 At AU $170, it’s a lot of money to shell out for a set, but it’s not just any set – it’s Hogwarts Great Hall! 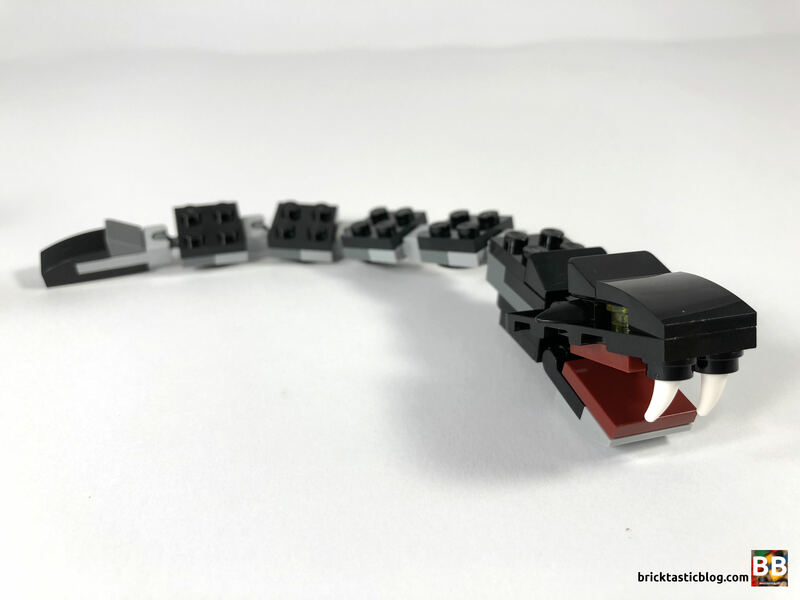 There’s a lot of great parts, including some stellar minifigures, many of which are unique to the set, and excellent redesigns. This set is only set to skyrocket in price, so it’s worth spending the money now. It’s Harry Potter after all! 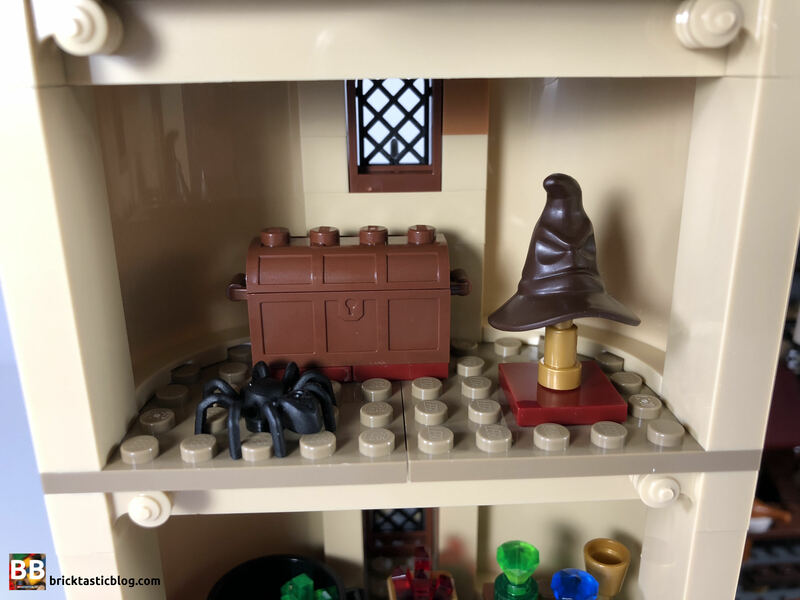 This set is a must for Harry Potter fans. Yes, it’s not cheap, but if you have the other sets, you need this one too. Just the brand of Harry Potter (and Wizarding World) means that it carries an extra level of collectibility. Even if you have all the previous Harry Potter set releases, you need this one too. It’s a highly collectible set – if you see it at a discount somewhere, pick it up.